AUSA Suncoast Chapter welcomes our new President, Eric Lien. This means we are saying goodbye to COL Rodriguez who served as president of AUSA Suncoast Chapter for 5 years. We would like to take this opportunity to say thank you, COL Rodriguez for your faithful service, welcome Eric. 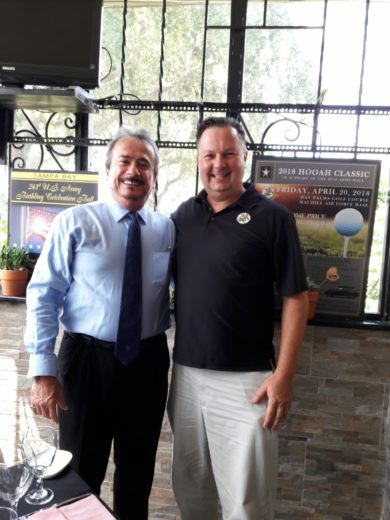 AUSA Suncoast Chapter new President, Eric Lien, poses with AUSA corporate member and community partner, Luis Zamora, owner of Vino E. Pasta Restaurant, Tampa, FL. Eric, former Region President, European Region AUSA, Germany, became chapter president recently following the presidency of COL. Jorge Rodriguez ( r ). COL Rodriguez served as president of AUSA Suncoast Chapter for 5 years. Thank you, COL Rodriguez for your faithful service, welcome Eric. 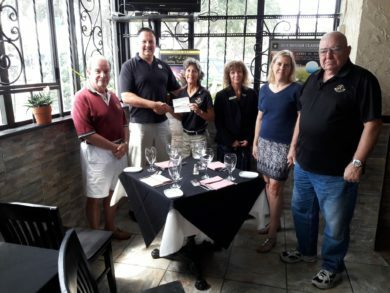 AUSA Suncoast Chapter President Eric Lien and executive board members presenting contribution checks to Toni Gross, VP JROTC for American Gold Star Mothers, Inc. Tampa Bay and the US Army CPL Frank R. Gross Scholarship at Indian Rocks Christian High School, Largo, FL. Pictured with Eric, left to right: LTC US ARMY Jim Barrett, Jr. ( r ), Karen McClain, Linda Lien, President Eric Lien’s wife, and US Army LTC Houston Tucker ( r ). The chapter supports many other community outreach programs including the Fisher House at James A. Haley VA Hospital, Tampa, FL, “My Warrior’s Place”, and JROTC programs at 20 plus high schools. Eric Lien was born in Tampa, Florida in 1967. He holds a Bachelor of Arts in business administration from St.Andrews Presbyterian College and a Masters Degree in international business studies from the University of South Carolina. He is fluent in German and a certified SCUBA diving instructor. He has over twenty-five years experience as a senior executive in international business and has a global network of professional contacts. Chapter in 2012. From 2013-2018, Eric served as President of the European Region of the Association of the U.S.
Army. His area of responsibility included Europe, Africa and the Middle East where he worked closely with chapters and commands. In keeping with the mission of AUSA, Eric refocused the EMEA chapters of AUSA to emphasize educational and professional development events. In July 2018, Eric relocated to his hometown of Tampa, Florida where he assumed the role of President of the Suncoast Chapter of AUSA. As part of the Third Region of AUSA, the Suncoast Chapter serves eleven counties in West Central Florida including the military communities of MacDill AFB, CENTCOM and SOCOM.